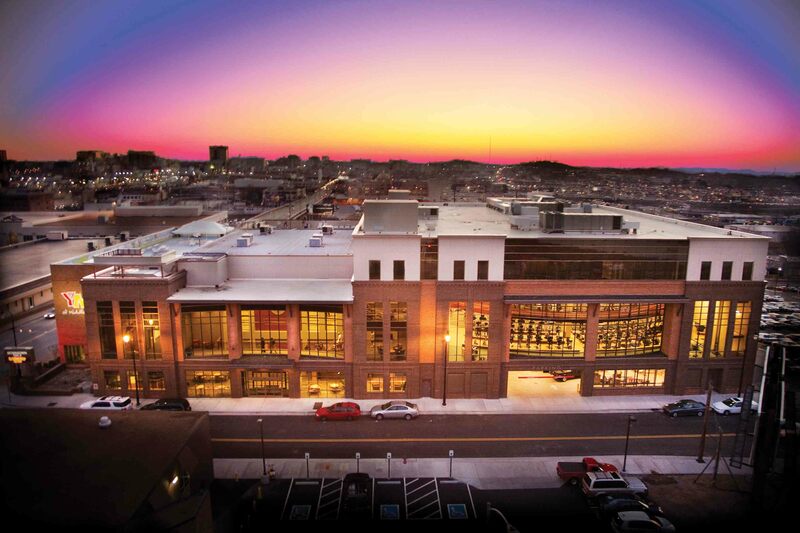 The Downtown YMCA pictured at sunset; renovated and expanded in 2008, it is the third home of Nashville’s Downtown Y location. The revitalization project earned numerous awards for architecture, design, and downtown redevelopment. In the middle part of the nineteenth century, Nashville was a bustling center of industrial, commercial, and political activity. Founded eighty years earlier and named for Revolutionary War hero Francis Nash, the city’s strategic location on the Cumberland River and its growing importance as a railroad center led to Nashville being selected as the state’s capital in 1843. 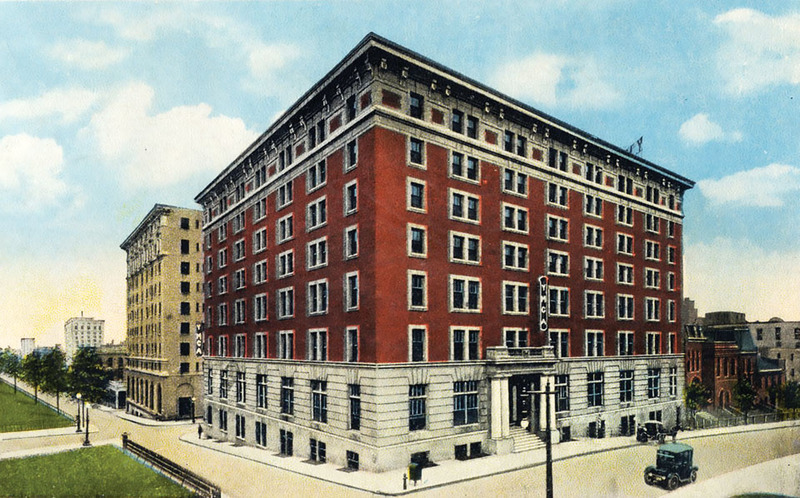 The Downtown YMCA’s second home, located at Seventh Avenue North where the Sheraton Nashville Downtown currently stands. A group of forward-thinking community leaders sought to provide safe environments and wholesome alternatives to the sometimes mean streets of a growing city. Like their London counterparts who founded the YMCA movement, those visionaries in Nashville founded a local chapter of the YMCA in 1875 with a desire to nurture strong Christian character in young men. Nashville luminaries, including Matt Pilcher, Tom Ryman, E.W. Cole, E.B. Stahlman, W.H. Jackson, and others raised the funds necessary to construct the Y’s first building, located on Church Street at the corner of then College and Cherry Streets. The portrait of H.G. Hill, Sr. commemorates his 13-year tenure as board president, the longest term served by any volunteer leader of the Nashville YMCA. As Nashville grew, so did its YMCA. Certainly no family has been more instrumental in the life of the YMCA of Middle Tennessee than that of H.G. Hill, Sr. 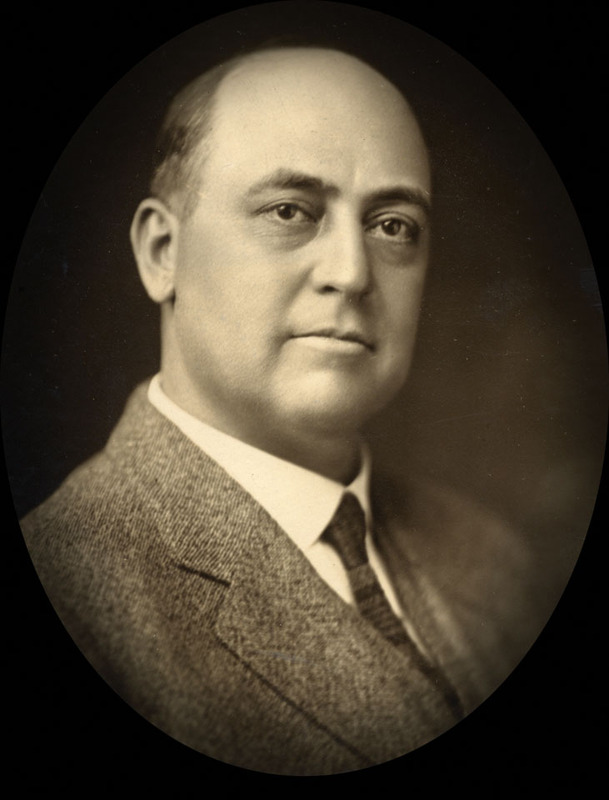 The founder of the grocery store chain bearing his name, Mr. Hill became involved with the Nashville YMCA in the early 1900s and served as the organization’s chairman longer than any other volunteer in the Y’s history. During that time, Mr. Hill saved the Y from near financial peril following the First World War. His son, H.G. Hill, Jr. continued the family’s legacy of service when he became president in 1965, ushering in further expansion of the Y’s services to suburban areas. The family’s support of the Y did not end with the second generation of Hills. In 1979, nephew Wentworth Caldwell, Jr. joined the board and went on to serve as both secretary and vice president. The family remains a YMCA stalwart today. In 2016, H.G. 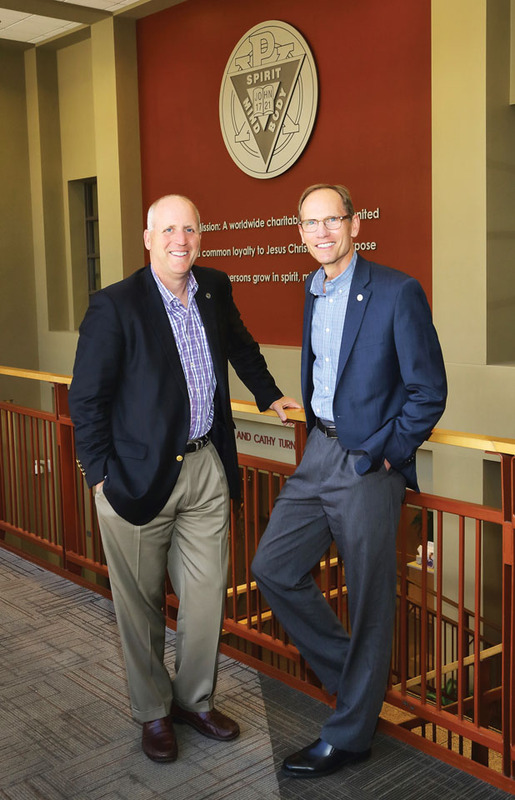 Hill, Sr.’s great-grandson, Jimmy Granbery, became Chairman of the Board of Directors of the YMCA of Middle Tennessee. Below, his son H.G. Hill, Jr. accepts a resolution from fellow Y volunteer Roupen Gulbenk commemorating his service as board president. The Hills were the only father-son combination to fill the position. 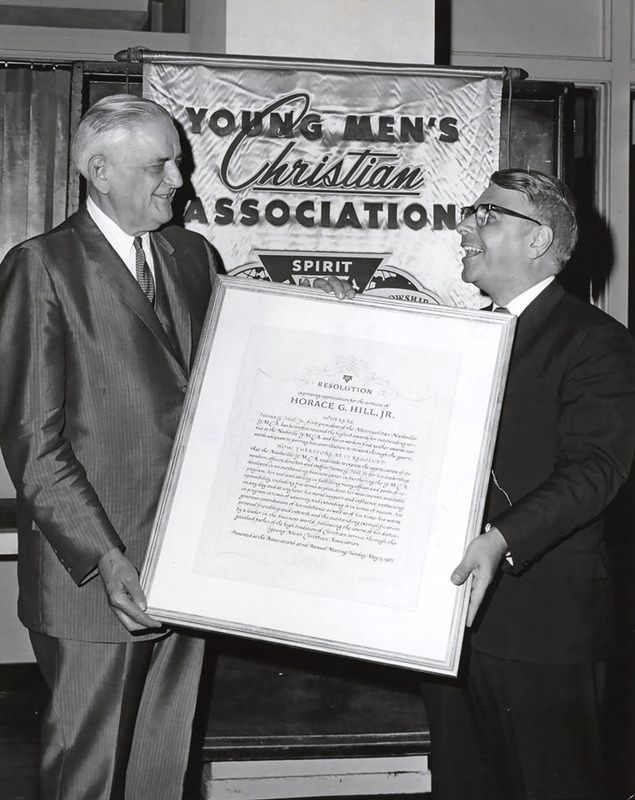 What began as a few men coming together for the common good grew into the nation’s eighth largest YMCA association. Today, the YMCA of Middle Tennessee reaches almost 300,000 people annually, nearly a third of those being youngsters. Through its shared commitment to Youth Development, Healthy Living, and Social Responsibility, the Y continues to nurture the potential of children and teens, improve health and well-being, and provide opportunities to give back and support neighbors in need. The YMCA of Middle Tennessee today helps hundreds of thousands of individuals pursue full and healthy lives in spirit, mind, and body and continues to bring communities together for the common good. The YMCA of Middle Tennessee reaches out to residents over a six-county service area, including Davidson, Montgomery, Robertson, Rutherford, Sumner, and Williamson Counties. In addition to being the eighth largest YMCA in the country in terms of annual operating revenues, the Y ranks eighth in the country in terms of philanthropic support and third in terms of total members. The Y’s leadership understands that it takes more than treadmills and tracks to be healthy. For that reason, the organization’s mission is to help each person it serves—in spirit, mind, and body. 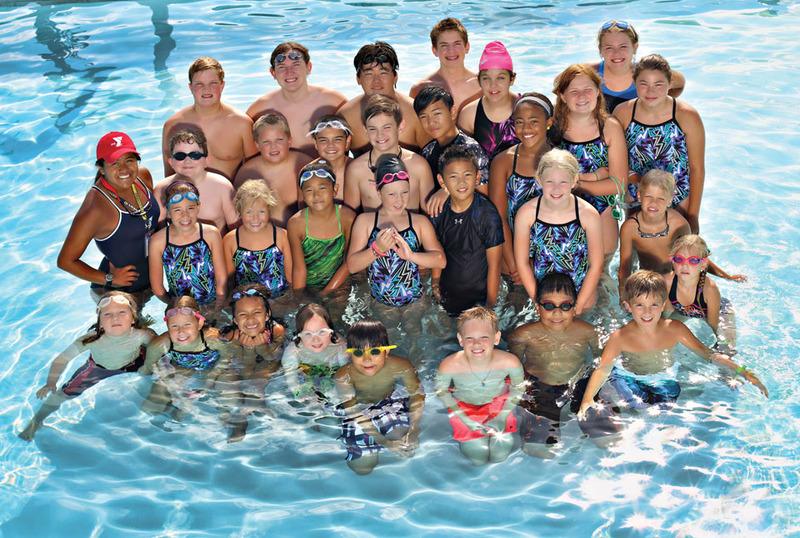 The YMCA of Middle Tennessee is the region’s largest provider of holistic health and wellness services, before- and after-school childcare, and swim lessons. The Y also nurtures the potential of thousands of youth in its sports programs, day and resident camp, and community outreach programs aimed at fostering learning and life skills development. In essence, the Y fosters an environment of a community of people who care—about one another, about their neighbors, and about the future they are building for their children. That has been the essence of the Y since its inception and will always be its heart. Fourth-generation Hill family descendant Jimmy Granbery with YMCA President and CEO Dan Dummermuth. The YMCA of Middle Tennessee continues to be led—as it has been since its founding—by dedicated staff and volunteers with a shared commitment to making the greater Nashville community stronger by helping people grow in spirit, mind, and body. Those 400 full-time and 3,200 part-time employees focus on fulfilling the Y’s charitable Christian mission of strengthening the local community. They work side-by-side with their neighbors to ensure that everyone, regardless of age, income, or background, has the opportunity to learn, grow, and thrive.